Every holiday season we all struggle to keep track of all the gifts we are giving. Balancing the different gifts we have to buy and the money we have to spend can be tricky. 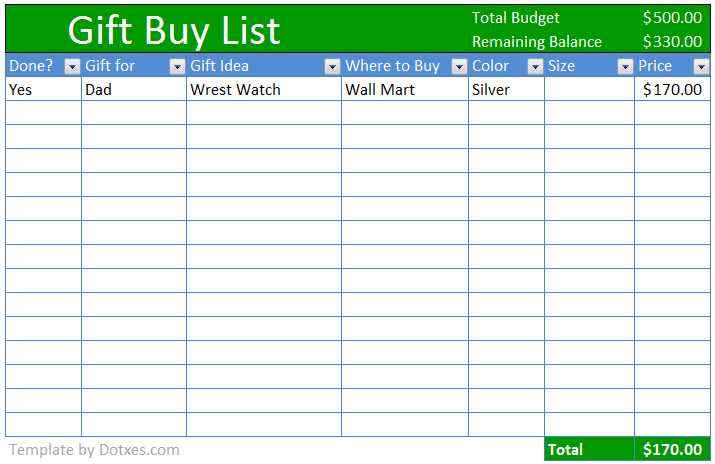 Using a gift giving template can help you keep your gift lists organized and help you maintain a budget so you don’t spend too much. 1. Beautifully designed and easily customized. Our gift checklist not only looks great, but is easily customizable so you can create the perfect template for your gift giving needs. We recognize that your template needs may be different from someone else that is why we have created a template that can easily be edited so you can create the perfect template. Our gift checklist template has been made compatible with all recent versions of Microsoft Excel® including all versions between 2007 and 2013. No matter what version of Microsoft Excel® you own, our template will work. It’s important when buying a lot of gifts such as during the holiday season that you maintain a budget so you can be sure you don’t overspend or over extend yourself. Our gift giving checklist includes budget functions so you can track exactly how much you spend on each gift and what your overall spending is while on your gift giving shopping spree. 4. Available at no cost to you. You don’t have to spend any money to gain all the features and benefits of the gift checklist template. We have made this template available to you absolutely free. Using our gift giving checklist will help you keep track of all your gift giving needs whether it’s the holiday season or not. In addition, the budget features will help you keep track of exactly what you spend so you don’t have to worry about going over your budget. It’s easily customizable, looks great and is available for you to download absolutely free. Make gift giving much easier during the next holiday shopping spree by using this easy to use gift checklist template.